When we booked plane tickets to visit Malta in September, we knew exceptionally little about it. We knew that it would be warm. We knew that it had beautiful water. We knew that the cities looked pretty in pictures. We knew that it was a decent deal to get there from Budapest, and to Rome afterward. … That was about it. Traveling with limited knowledge of what exactly we’re going to do somewhere is something that we have been having increasing amounts of fun with over the last couple of years, but it was definitely still an unusual feeling to book a plane ticket to a country we knew very little about. 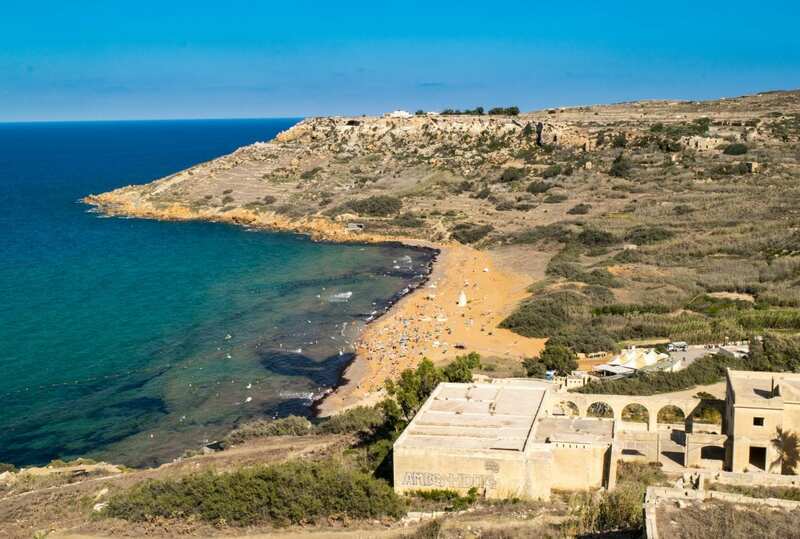 As it turns out, there are plenty of excellent things to do in Malta in September for travelers seeking some sunshine and sea breeze. Sure, the water may have been a bit chilly for swimming for our taste, but that didn’t stop us from enjoying all the country had to offer (including a bit of cold swimming!). Here are some of our favorite things to do in Malta (and some that we wish we had gotten a chance to try!). Visit the Marsaxlokk Fishing Village. 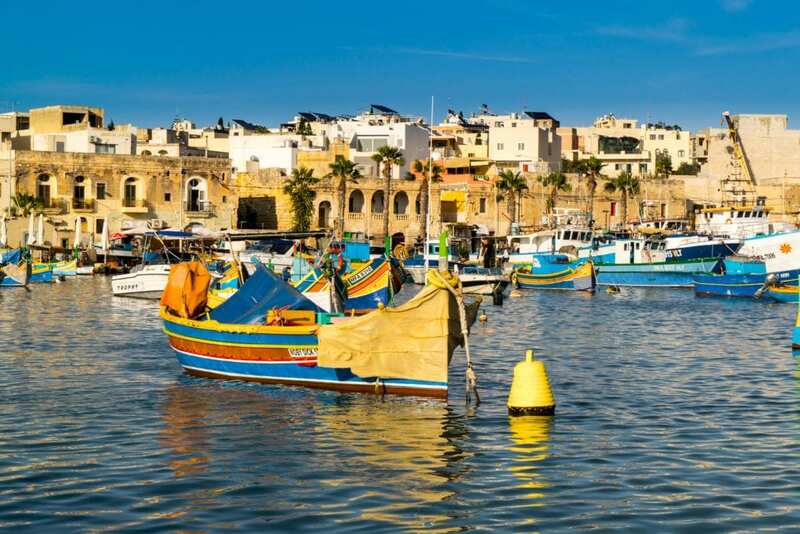 Home to a harbor full of colorful wooden fishing boats, a lovely waterfront stuffed with restaurants serving fresh seafood, and a fish market on Sundays, this is the perfect place to spend a day in Malta. Dive into St. Peter’s Pool. Located about a 35-minute walk (or shorter taxi ride, if you feel like negotiating with a driver in town), this naturally formed pool is incredibly beautiful and the perfect place for a swim. Visit the Hagar Qim temples. Three thousand years before the Romans, more than 5000 years before us, the temples of Hagar Qim were built on Malta. That amount of history boggles the mind–and it’s all the more reason to stop by and stare in wide-eyed wonder at these remarkably well-preserved temples that date to 3600 – 3200 BCE. Malta’s history is impressive–for the history lover, Malta’s megaliths and ancient temples will be a huge draw. Wander the streets of Valletta. 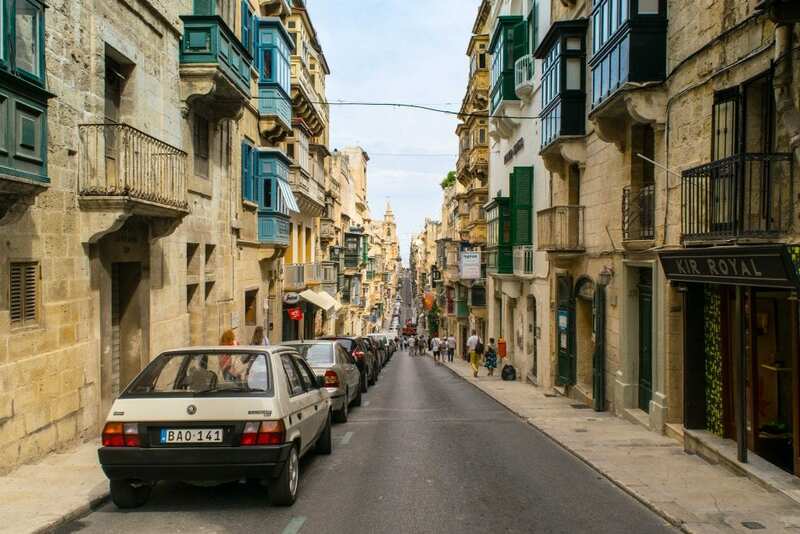 The streets of Malta’s capital city are absolutely gorgeous, and down every road you’ll be able to see the enclosed balconies that Malta is known for, which give its cities its distinct look. It’s no surprise that Valletta is regularly named among top places to see in Malta! We had some amazing fresh pasta here at a restaurant called Pastaus near the center–if you a get a chance, go, and be sure to order whatever noodles the family running the shop tells you goes best with the sauce you pick. Take the Three Cities Ferry. Across the water from Valletta sit the Three Cities of Birgu Senglea, and Cospicua. Once fortified cities important to Malta’s defense, these are now excellent neighborhoods for exploring–and the ferry across the water is the perfect way to get an amazing view of Valletta. Check out great Three Cities Tours (some including wine tasting!) on Get Your Guide! 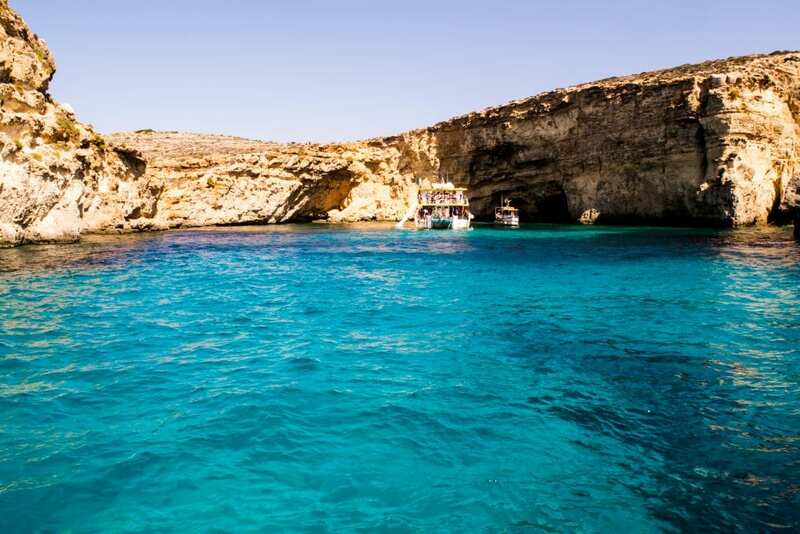 Malta’s most famous site (and absolutely unmissable among things to do in Malta), the Blue Lagoon near the island of Comino, is accessible from the main island only by boat. If you don’t want to miss a chance to swim in the turquoise water the lagoon is known for, you have a few choices–most popularly, enormous ferries run out to the lagoon a few times per day. Or… you could take a smaller tour. We were invited on a day trip with Barbarossa Excursions that included stops at both the Blue Lagoon and the lesser known (but equally gorgeous) Crystal Lagoon, a light lunch, and our afternoon tour of Gozo. The swimming was incredible, we dealt with far fewer people on our boat, and the best part? We got to the Blue Lagoon well before any of the large ferries, and our group had the Blue Lagoon almost entirely to ourselves for an hour–considering the horror stories about how crowded it can get, we considered that quite the perk! Take a Jeep tour of Gozo. One of our favorite things we did in Malta was to explore the nearby island of Gozo via a half-day Jeep tour: we were able to visit highlights of the island efficiently (including the former location of the Azure Window–so sad we missed it! ), and our guide, Tony, kept us laughing the whole time. The views around Gozo are amazing, and well worth the trip over from the island of Malta. Some favorites? The beach near Calypso caves, all of the coastline where the Azure Window used to be, and the view back toward Comino and Malta–the Blue Lagoon is so bright, you can see it clearly even when perched high on a hill on Gozo! 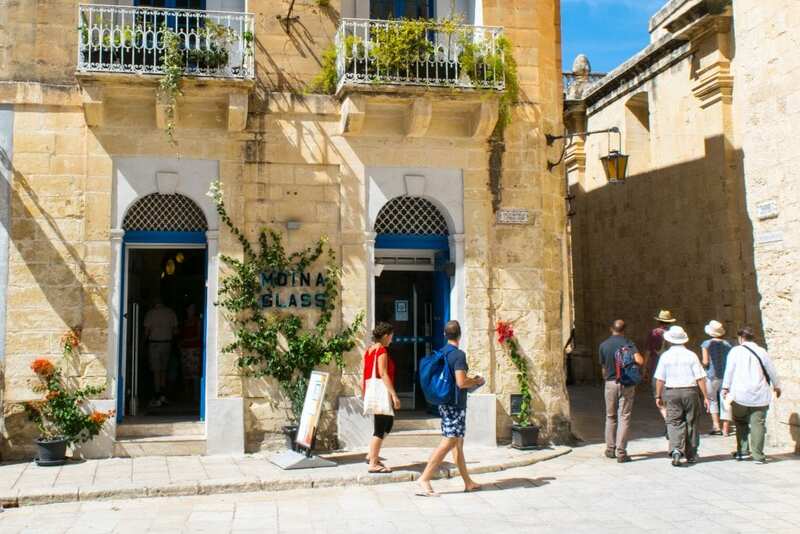 Tour the “silent city” of Mdina. More than just a season one Game of Thrones filming location, the walled city of Mdina is home to just 300 people and a very limited number of cars, giving the city a hushed quality that makes it easy to feel you have stepped back in time. 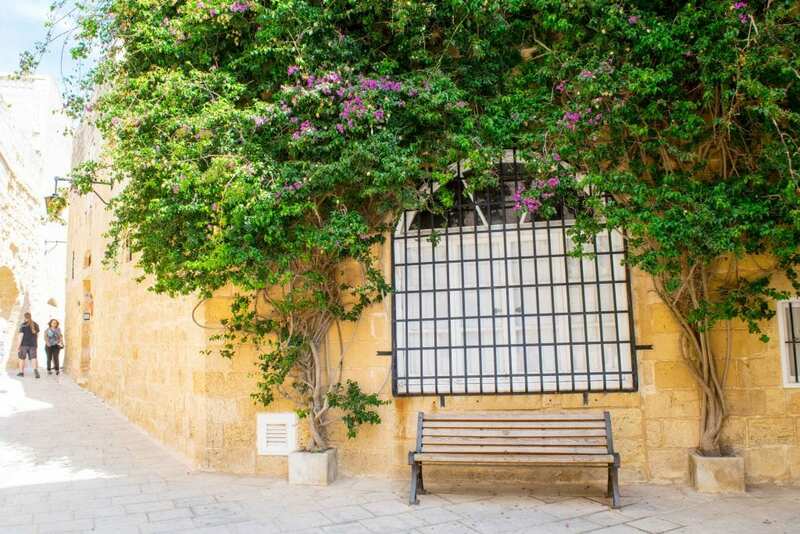 Settled more than 4,000 years ago, long before the current capital city of Valletta was built, Mdina is home to oodles of history and was potentially once the home of the Apostle St. Paul. Though we visited during the day and had a great time, I would love to go back in the evening and watch the sunset over the city: at night, Mdina is lit by lamps, giving it an even more timeless feel. Don’t head to Malta without travel insurance! We use and recommend World Nomads for their affordability, ease of purchasing & the clarity of their contract! We didn’t have time to add scuba diving to our list of things to do in Malta on this trip, but felt an ache for it as we watched divers head into the water–particularly on our Gozo Jeep tour. 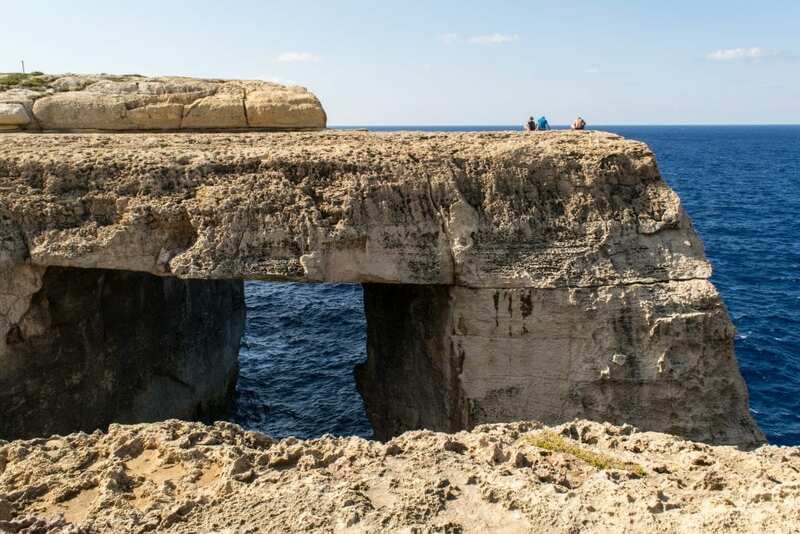 Malta is home to some incredible dive sites, including a fairly new one–the famous Azure Window is technically still able to be visited… you just have to go underwater to see it! Long before Game of Thrones descended onto Malta to shoot, Malta was home to another production: the 1980 movie “Popeye” was filmed here, in a “village” set built especially for the movie. It has now been turned into a small family theme park and–more commonly–a photo op, as the village set against beautiful Anchor Bay is incredibly picturesque. 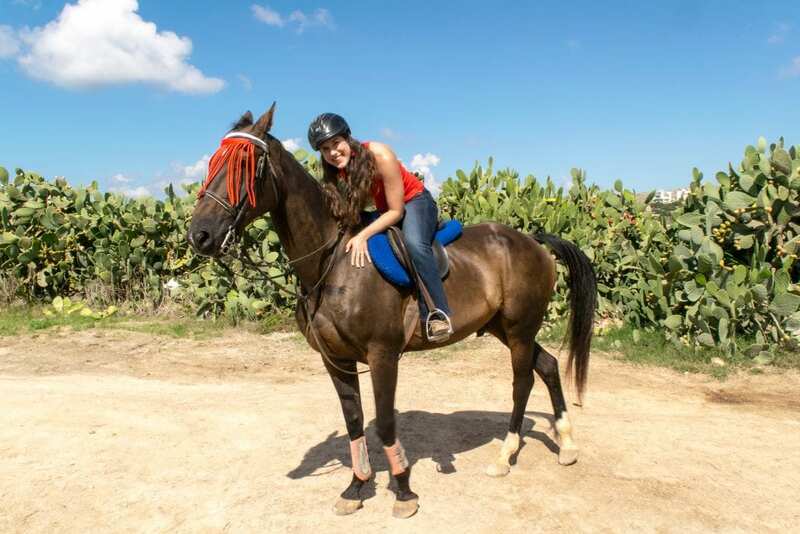 Go horseback riding along the cliffs. Like much of the Mediterranean, Malta’s beaches run more to rocky shores and beautiful cliffs than to smooth sand (though they do have their share of sand beaches, too!). The cliffs are gorgeous, and what better way to see them than by horseback? 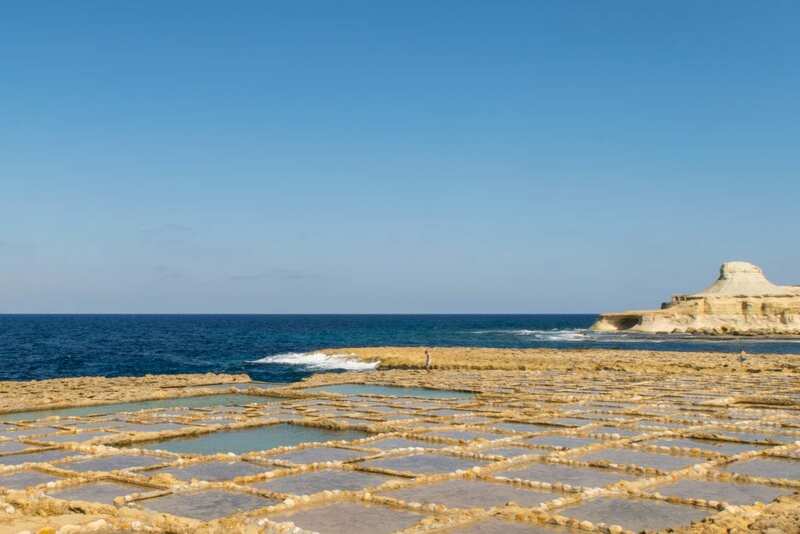 Go for a ride to check out Malta’s beauty from a whole new angle–oddly, we got some flashbacks to Texas along our ride until we reached the coastline: Malta has a somewhat surprising (to us, anyway) rocky desert feel in many areas! : I wouldn’t have been able to take our boat excursion without them! : Unlike most of Europe, you’ll need Type G adaptors (aka UK power adaptors) for your electronics here. : Our catch-all lightweight bag still makes the perfect beach bag! 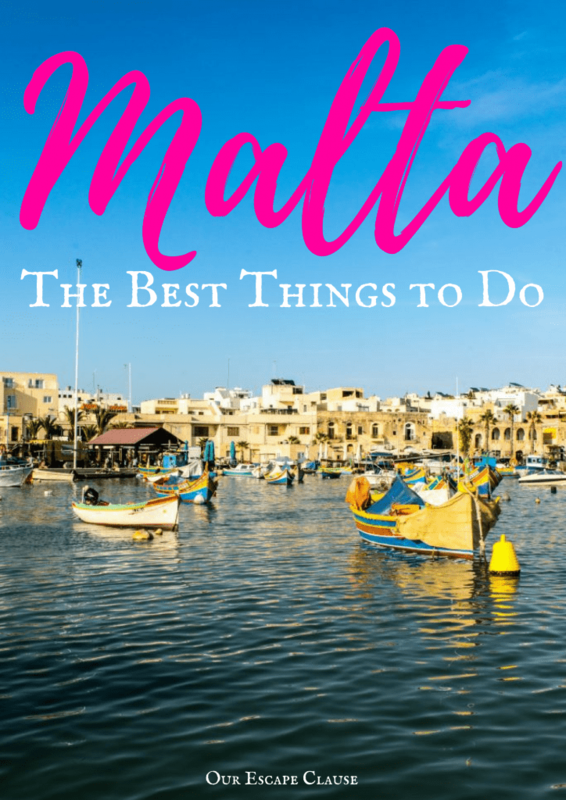 We loved taking the opportunity to be surprised by this tiny country, and we definitely found plenty of marvelous things to do in Malta–though like in most destinations we take on with little planning, spontaneity has its tradeoffs: we probably would have gotten more checked off this list of things to do in Malta in September (like scuba diving!) had we done more research ahead of time! Central Suites — This apartment was perfectly comfortable, but we wouldn’t stay here again: it’s location in Bugibba was too far out of the way, and we spent way too much time on buses back and forth to Valletta (about 45 minutes each way) during our time in Malta as a result. If you’re looking for a quiet, out-of-the-way location, Central Suites might be a good pick for you. If we go back to Malta, though, we’ll definitely stay in Valletta. Check out great places to stay in Valletta on Booking.com! 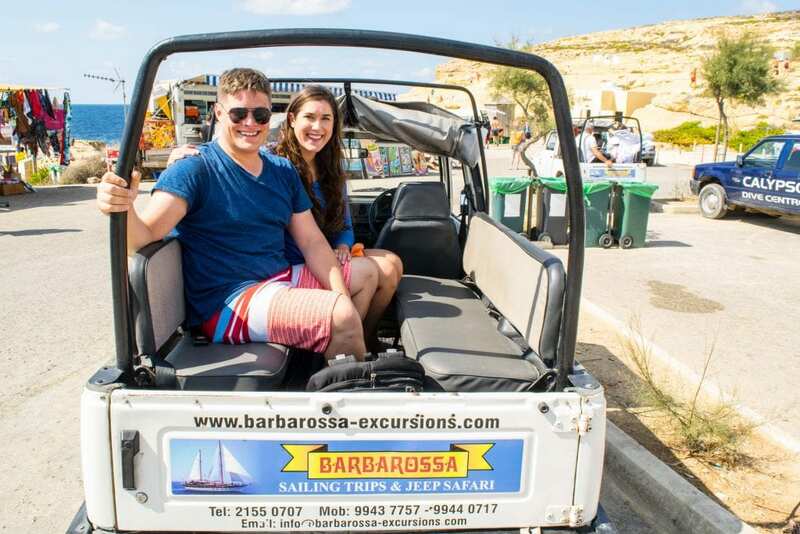 Many thanks to Barbarossa Excursions for hosting us on our full day tour of Comino and Gozo! All opinions are, as always, our own. Some links in this post about marvelous things to do in Malta are affiliate links. If you click through one of these links, we may earn a small commission at no extra cost to you. We are committed to only ever recommending products and services that we personally use and like. I love your street shot of Valletta, the Maltese balconies photograph so well! I visited Mdina at night and I think I’d have preferred to visit during the day. The lights they used to illuminate the city are a little yellow which made it difficult to photograph naturally. The jeep tour of Gozo looks super fun! The Azure window is high up on my wish list for scuba diving! 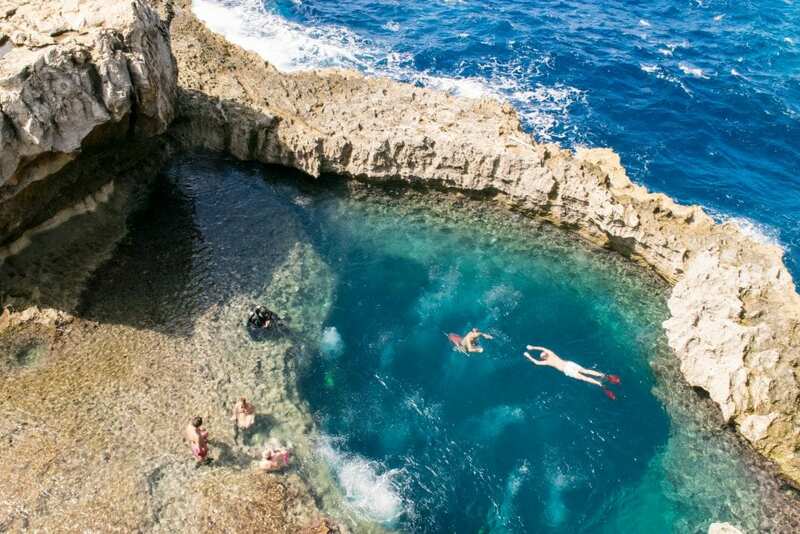 Malta looks like the perfect water vacation for swimming, scuba, boating, and fishing. It is nice to see all of the “land” activities, too! It definitely is–perfect coastal destination for water activities, and plenty to do on land, too! I’d love to visit Malta especially as it’s so close to Sicily and I’m there often. Ive heard good things about Gozo so would like to see it for myself. Valletta looks gorgeous! Almost like the Sicilian streets! You should definitely make a trip over! We’d love to visit Sicily–hoping to make it there in the next couple of years. Malta is stunning and it is always on my wishlist. The blue waters of Blue Lagoon are so inviting. Wandering in the streets of Valleta is my favorite thing to do here. I would love to capture the cityscape of Malta with traditional houses. Visiting Mdina and getting soaked in dim lights of lamp for timeless feeling must be so great. It’s a wonderful place–when you go, I definitely can’t recommend enough getting to the Blue Lagoon early in the day. I can’t imagine how different it must feel while crowded! I have been longing to visit Malta since quiet some time. Marsaxlokk Fishing Village looks like a great place I would love to have a some fresh sea food with lovely views. I would love to go for a Jeep tour to Gozo. Marsaxlokk was one of our favorite places in Malta! The colorful fishing boats are so cute. Malta is one of my dream destinations! It looks so nice and seems like it would always be warm and sunny. I’d definitely be up for all the things you’ve suggested, especially diving. I can’t believe the colour of that water! Right? The water in the lagoons was crazy! Warm & sunny was definitely what we were going for–we booked this trip while dealing with the rain and cold weather in Slovakia! Malta IS spectacular – I guess that needs to be said even though it is so obvious by your photos. I’ve always been curious about Valletta since it’s a UNESCO site. But I see that Malta has more to offer! St. Peter’s Pool is one of a kind! It definitely does have more to offer, but Valletta is beautiful–one of our favorite places that we visited in the country! I really didn’t know a lot about Malta before reading this post, but it looks like a beautiful country. That jeep tour of Gozo sounds like a lot of fun. And I love checking out historic sites so a visit to Hagar Qim would be amazing. The Jeep tour was one of our favorite events of the week–amazing views, great guide, and perfect weather to top things off. 🙂 Definitely look into it if you go!